I switched out the battery on my iPhone 5 today and everything worked when I put the phone back together. I then noticed that the top part was not fully flush with the phone, so I opened it back up and put it back flush. During this process I must have damaged something because now there's no image on the screen except white lines and boxes. I can still turn the phone on and hear the phone ringing when I call it. Should I bother buying a replacement LCD or should I just right it off as loss? Dave, clean those connectors with a cotton swab dipped in 90%+ isopropyl alcohol, or simply brush it lightly using a dry soft tooth brush, then take a new photo. I believe the board connectors themselves are not damaged and there is some residue on that connector. Thanks for the suggestion Rany. I've cleaned it as you've suggested and I think you're right--the markings were just residue (http://cdn.img42.com/31842ed4d3c80e517b9...). So it looks like the connectors are intact. Might just gamble and get a new LCD assembly to see if it'll work. May need a new screen. But first step, would be to open iPhone again, and carefully reconnect the screen flex connectors perfectly. If still problem, get new screen. Thanks for the quick reply! I've reseated it already and no still didn't work. I don't mind buying a new screen, but I'm worried that I've actually messed up the board, in which case I'm just throwing good money after bad. Is there a way to tell if the board is ok? Call a local shop and ask if they have a cracked screen with working LCD that you could test for a moment. You can't have seriously messed up the board from this, worst case scenario is just LCD connector damage--a board repair that costs about the same as a screen. Most likely case--you have damaged one of the flexes on your screen. It is not a backlight problem if you can see some lines on your screen, so this is almost certainly screen damage. The only other choice is damage to the connector itself which you should be able to if you look very hard. Thank you Jessa. Here's an image of the connectors (http://cdn.img42.com/1926cf9b195249c2ab2...). 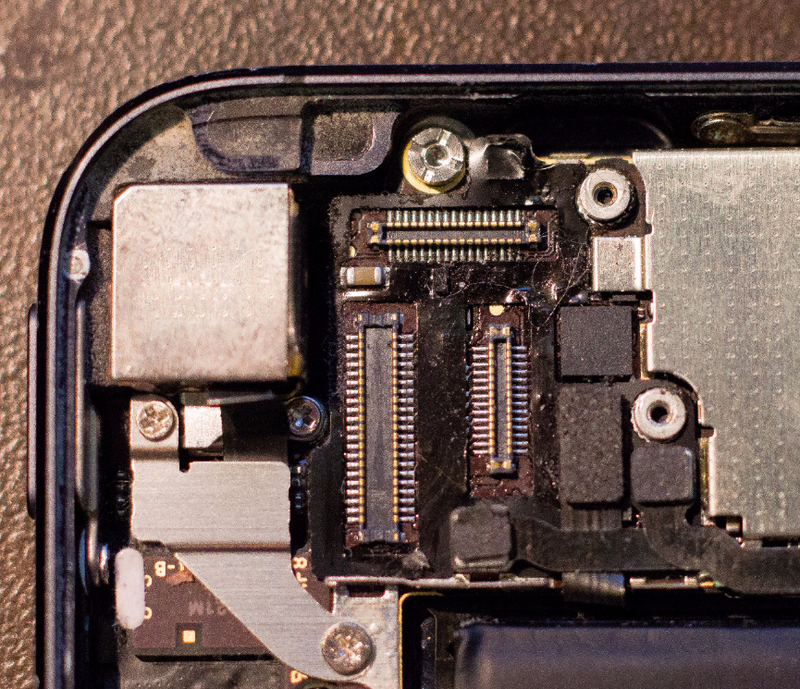 It does look like one of the connectors is damaged, but if I'm not mistaken, that's the front facing camera connector--shouldn't affect the image, right? Connectors are fine, likely screen defect. But that area was quite dirty so you might want to peel off that black sticker and clean under it.